Read more about new features in our blog. Become a beta-tester of QuizMaker 8.0 and check out all new features now. We will include you in the beta-tester list and will send you a beta-version build with the registration key and other instructions. I'd be interested in becoming a beta-testers. in order words: is everything 100% backwards compatible? 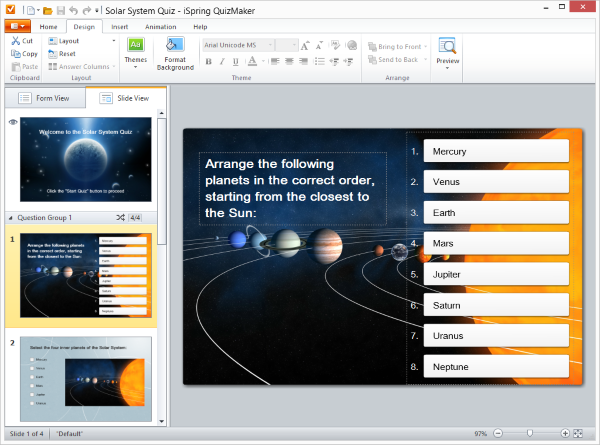 Appreciate your interest in the nextgen version of iSpring Suite and iSpring QuizMaker! Yes, iSpring QuizMaker 8 allows you to work on the files that were created with the previous version of the software (version 7.1). However, the files of version 8 can not be opened with the previous version. iSpring Suite 8 allows you to work on the files from version 7 as well. However, if you create a project in version 8, please be ready that is will not be launched properly in version 7.1. There is an inconsistency in the beta download that I actually like. I use a dual boot OSX/Windows 8.x platform. When I try to download a copy of iSpring from the official download it complains that I have a Mac and won't proceed. The beta version link allowed me to download from the Safari browser, reboot, and install on Windows. I know some people may mistakenly try to download on Mac and install, but this saved time for me. I believe our customers, who are working on Mac, will definitely use your tip! I know it is difficult, but full-featured editing is needed for quiz creation/editing. I teach medical physiology and create elearning material with iSpring. iSpring is great, but I do so miss having easy access to superscripts and subscripts. Using charmap does work, but what a pain. We appreciate your attention to iSpring products. Could you please send us a feature request with your ideas to support@ispringsolutions.com? -we cant use marker tools with fullscreen. -I want to set the color pen writing. If I got you right, you mean our Universal player's marker tool. Could you please send us your suggestions as a feature request? We are always glad to hear your ideas! Could you please fill in a feature request form for us and illustrate it with screenshots or any other examples? Thanks in advance! We appreciate your attention to our products!